I know it drives my wife a bit nutty when she opens the refrigerator and sees a couple of shelves of condiments. See I grew up on condiments. My parents were condiment junkies, obsessed with what was new, and what varietal there was with things like mustards, ketchups, and mayonnaise. That’s probably where I got my own issues when it comes to going down a couple of aisles in the grocery store. I ALWAYS stop and look at different barbecue sauces, ketchups, olives, mayonnaises, etc. You get the point. But I have gotten better over the years, and sure, if my wife says to go get a second refrigerator, I’m sure my flood gate would open and that second refrigerator would start to load up on different condiments. But my narrowing it down, I have came down to three mayonnaises that I truly love and will need no other, other than homemade. Hellmans, Duke’s, and Kewpie. 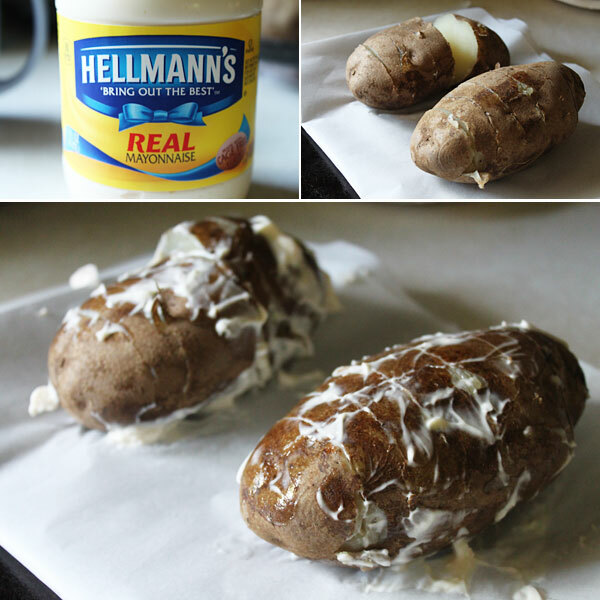 My wife and kids are not fans of mayonnaise all together, with the exception of including it in things like potato salad, and this particular recipe inspired me to get the awesomeness in mayonnaise embedded into some grilled potatoes without them knowing of course. I know when you think mayo, and grilling, that you may think ‘grosse’, but trust me on this one, it’s pretty rad. The mayonnaise actually creates not only flavor (and great flavor at that), but great crust and texture. Think of using mayonnaise beyond sandwiches and potato salads, and using it as a marinade for all of your grilling needs. That’s it. Really simple stuff going on here for your grilling needs. 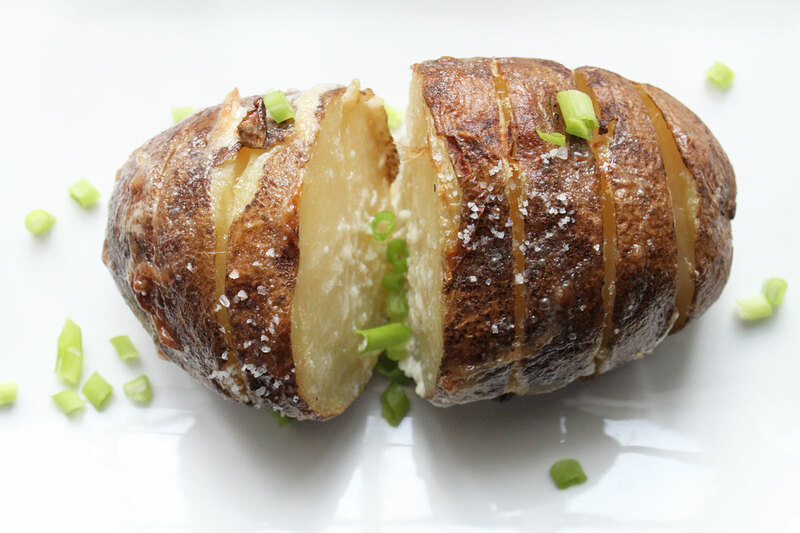 Start slicing your cleaned baked potatoes about 1 inch thick, about 3/4 of the way down. You still want them to remain in tact, but not fall apart. This is much like a hassleback potato, but a thicker slice. Next, lather the mayonnaise all over, and into the crevices, of the potato. Season with salt. Now you can do these in the oven if you desire and you can roast these as you normally would, but my grill was going that day and I decided to lay these on the grill for some additional flavor. However you decided to cook them, just cook them until fork tender. Once cooked, place these on serving plate and shower with some fresh scallions. If you are looking for different ways to use mayonnaise, give these mayonnaise crusted baked potatoes a try. I know next time, I will be grilling some up and lathering some mayonnaise onto them once they come off the grill! Hope you enjoy. I will definitely try this one, it looks so delicious. love your site and pictures and easy to follow recipies . thank you so much. Thanks Selma, I appreciate your comments, and hope you enjoy!